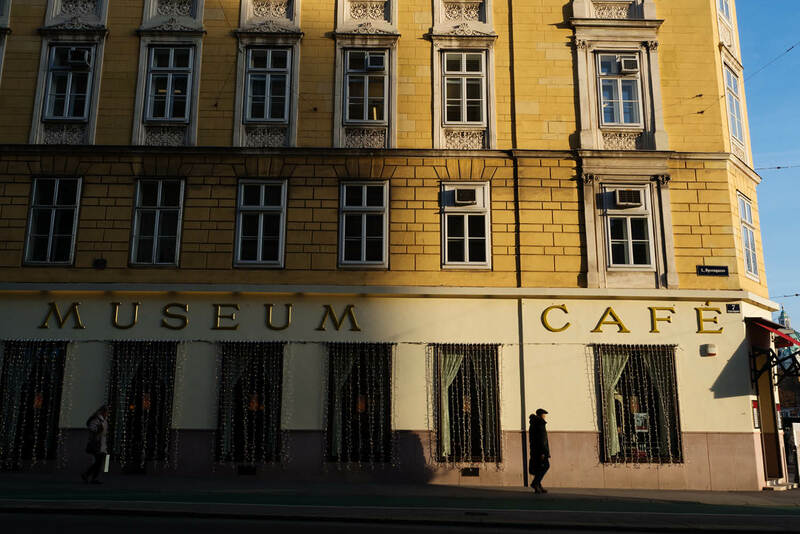 Drink coffee where the cool kids of Viennese modernism did, in Café Museum – an institution that dates from 1899 (photo: Imogen Eveson). Vienna’s modernist architecture cuts a contrast against its grand Imperial buildings (photo: Imogen Eveson). 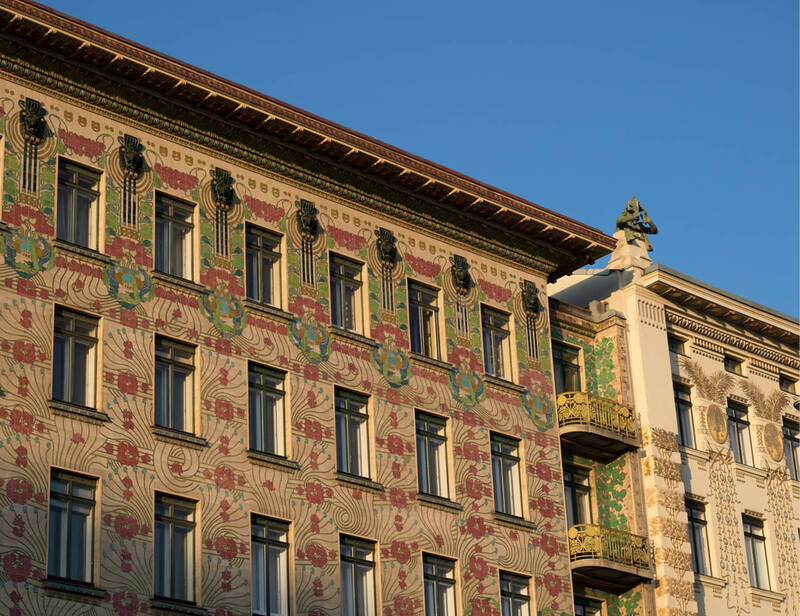 Otto Wagner’s colourful Majolica House is an art nouveau beauty (photo: Imogen Eveson). Complete with sunflowers, Otto Wagner’s ornate Stadtbahn design at Karlplatz is perhaps his most elegant. An art nouveau angel adorns Otto Wagner’s Church of St. Leopold (photo: Imogen Eveson). 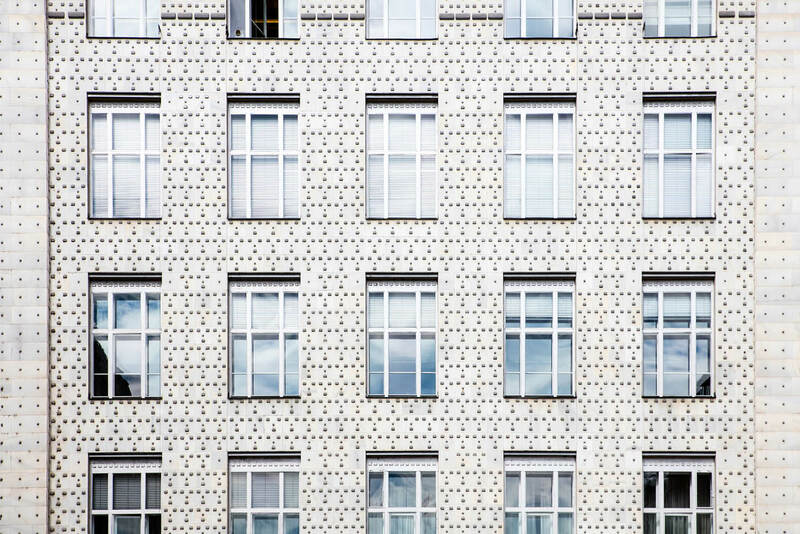 Constructed of stone, concrete, glass and metal, Otto Wagner’s Austrian Postal Savings Bank is one of Vienna’s finest works of modernism (photo: Imogen Eveson). 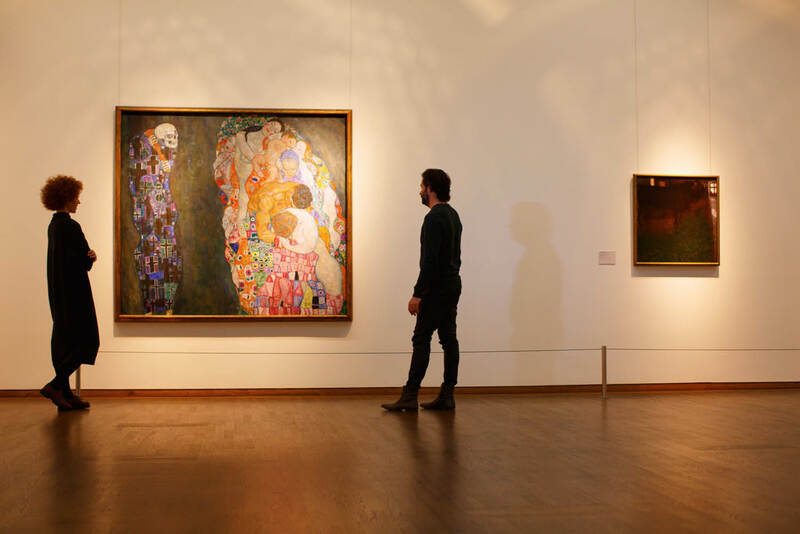 Explore the worlds of Gustav Klimt, Egon Schiele and more at the Leopold Museum. The iconic gold-leafed dome of the Secession building, which was built in 1897 as a manifesto of the movement. The fin-de-siècle period was an incredible time for modern art, design and architecture in Vienna and its zeitgeist is very much alive today. 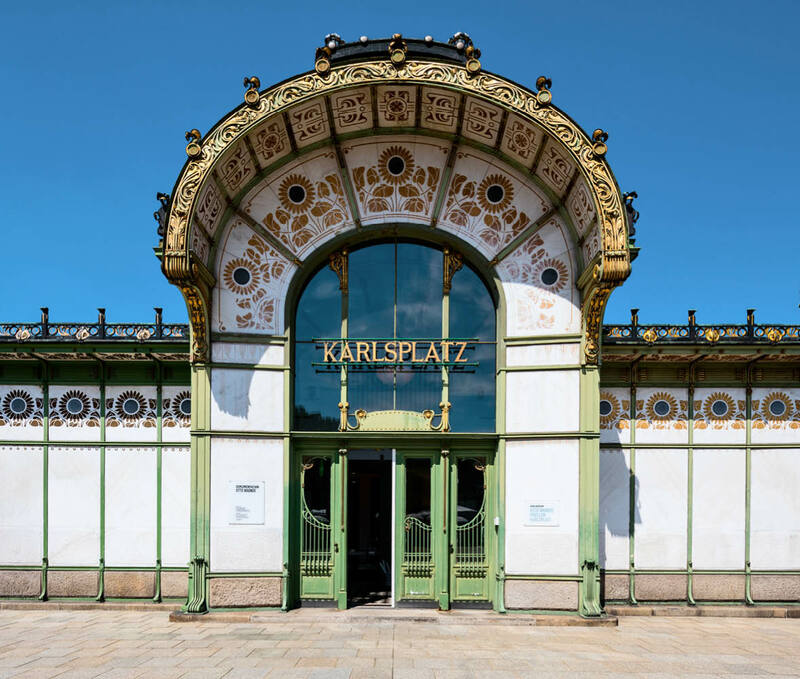 The city celebrates Viennese Modernism in 2018, 100 years on from the death of four of its key players, and here’s how you can too, writes Imogen Eveson. At the end of last year, the Vienna Tourist Board created a series of posters for its celebration of Viennese Modernism in 2018 that was deemed NSFW for the London Underground and German bus stops. The offending images were nudes by Egon Schiele, the Austrian expressionist who helped define one of Europe’s great 20th-century art movements with paintings and drawings that still look contemporary – and apparently too provocative – today. The tourist board’s clever riposte was to censor the works with the words ‘SORRY, 100 years old but still too daring today’, adding the tease ‘see it all in Vienna!’. Schiele died in 1918 at the age of just 28, alongside three other key protagonists of Viennese Modernism: symbolist painter Gustav Klimt, ‘universal’ artist Koloman Moser and architect Otto Wagner. The city is taking this watershed moment to shine a spotlight on its remarkable era of visionary artists and ideas. Here are some ways you can experience it. Vienna was once the capital of the Austrian-Hungarian Empire: it had over 53 million subjects across 15 nations, and all the wealth and grandeur to prove it. The Habsburg Monarchy crumbled at the end of the First World War, but luckily the Imperial architecture didn’t, and a wander around the compact city centre today reveals baroque and neoclassical masterpieces at every turn. But what makes the cityscape even more beguiling is the modernist buildings sprinkled liberally among it. Otto Wagner’s Austrian Postal Savings Bank building, for instance, has a stone, concrete, glass, wood and metal composition that looks contemporary today. It is in stark contrast to the former Imperial and Royal War Ministry headquarters opposite: a neoclassical building which – surprisingly – was completed one year after Wagner’s, in 1913. 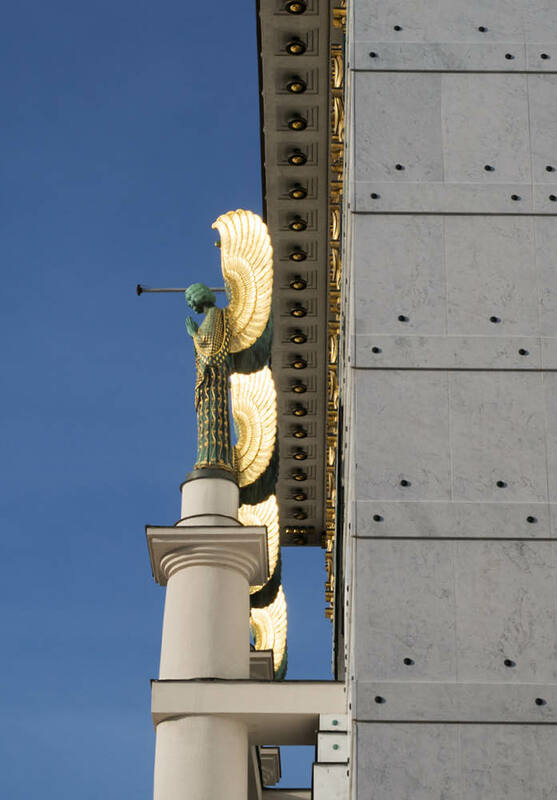 Book a modernism-focused walking tour with Travelcurator Vienna or discover for yourself. You can bookend a visit to three of Vienna’s most important works of architecture with a stroll through the Naschmarkt. With its name taken from the German ‘to nibble’, this famous market is home to around 120 stands and restaurants offering everything from Viennese to Vietnamese fare. 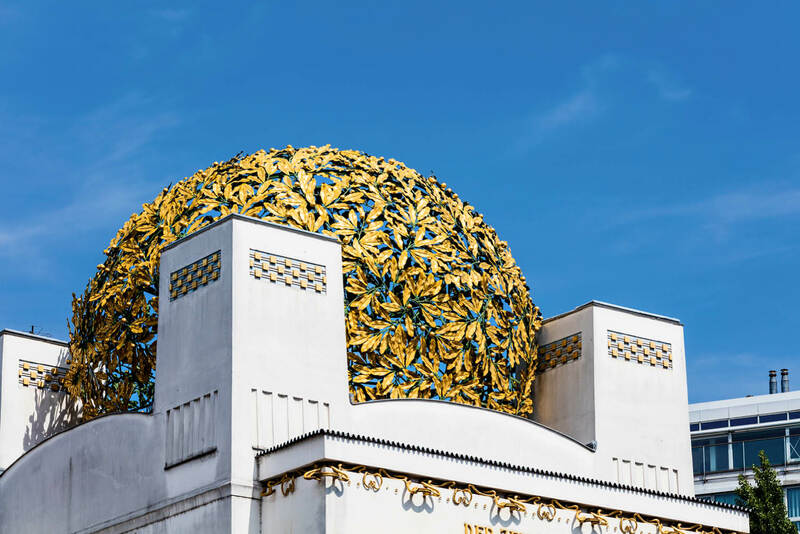 Start by visiting the gorgeous, golden-domed Secession building on the fringe of the inner city, then graze your way to the colourful Majolica House and its shimmering neighbour – two Art Nouveau beauties designed by Otto Wagner. All three shocked and provoked conservative circles when they were unveiled at the end of the 19th century. From here, hop on the metro back to the centre at Kettenbrückengasse; one of Wagner’s ornate Stadtbahn designs (his Karlplatz design, with its sunflower pattern, is perhaps most elegant). When in 1909, architect Adolf Loos unveiled his strikingly unornamented new building for tailors Goldman & Salatsch – now known as Looshaus – opposite the Imperial Palace, it caused a scandal, and Emperor Franz Joseph was famously displeased. A working bank today, you can still take a peek inside the ground floor. But for a somewhat more immersive architectural experience, visit the Loos-designed American Bar nearby. This shoebox-sized saloon is decked out in mahogany, onyx and marble and is a surefire way for you to soak up the zeitgeist of Wiener Moderne (visit in the afternoon when it’s not as crowded and smoky – smoking is still permitted in some restaurants and bars, including this one, in Austria). 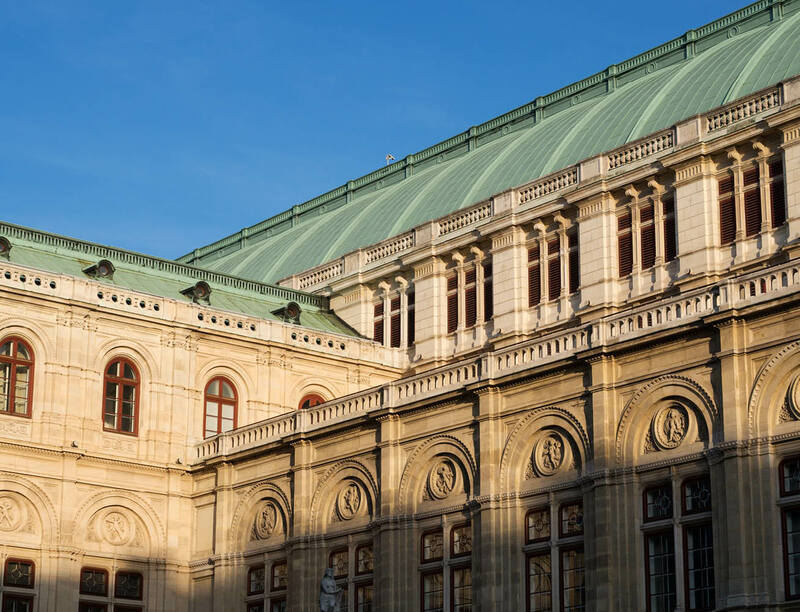 Visitors to Vienna might find themselves overwhelmingly spoiled for choice when it comes to galleries and museums, and so the MuseumsQuartier (MQ) is a fantastic place to start. An art complex near the Imperial Palace (in its former stables), its jewel is the Leopold Museum, which holds the world’s largest collection of works by Egon Schiele as well as many more works of art from the fin de siècle. Like many Vienna museums this year, the Leopold is hosting special exhibitions to celebrate the city’s year of modernism, including Egon Schiele: The Jubilee Show. The MQ is also a popular hang-out spot, with restaurants, cafes and bars, and comes to life especially during summer. Take the chance while you’re here to explore the trendy 7th district, which borders the MQ. Visitors following in the footsteps of Viennese Modernism can’t leave the city without seeing Gustav Klimt’s The Kiss in the flesh. Head across town to the Belvedere for the pleasure. Hipster coffee culture was flourishing in Vienna long before it was in Melbourne. At the turn of the 20th century, Vienna was transforming into the artistic and intellectual centre of the world, thanks in part to the intellectuals, artists, architects, writers, musicians, designers and more who crossed paths in the city’s salons and coffeehouses. Café Museum, which dates from 1899, was one of the coolest haunts in town. A two-minute walk from the Secession building, its patrons included Klimt, Schiele, Wagner and Loos, who designed the original interior. Today, it celebrates its history while exuding a slightly more classic Viennese vibe. Here’s your chance to try traditional-style coffee – including a Wiener Melange (half espresso, half hot frothy milk), Salon Einspänner (double espresso topped with whipped cream) or simply a Kleiner Schwarzer (a single espresso). All come served with a customary glass of water. For your long blacks and your soy flat whites, head to Erich in the city’s 7th district. It has a great contemporary breakfast, lunch and dinner menu (for after you’ve had your fill of Wiener schnitzel of course) and a back dining space that, painted gold, feels like the inside of a Klimt painting. If you fancy bringing home a Viennese Modernism souvenir that’s a little more inspired than a Klimt fridge magnet, then book a Shopping with Lucie! tour. Lucie Lamster Thury, a fun and engaging former New York stylist, steers you away from the main drag to some of Vienna’s best shops and boutiques that you might not discover otherwise. A modernism-themed tour includes stops at the historic Wiener Silber Manufactur, which has been in the silver game since 1882 and still reproduces original designs from the likes of Josef Hoffmann and Koloman Moser (a set of cutlery has never looked so interesting); and Österreichische Werkstätten, a lifestyle store that has a Wiener Werkstätte and Art Nouveau focus. Also, for (high-end) Vienna Modernism-inspired fashion, check out Petar Petrov (available at concept store PARK in the 7th), who cites the era as his constant inspiration. Australian skincare brand Aesop recently opened its first Austrian store in Vienna’s 1st district, and its interior design is based on the work of 20th-century architects like Loos, and the atmosphere of old Viennese coffeehouses. A member of Design Hotels, Hotel Topazz in Vienna’s 1st district is an homage to Viennese Modernism. Its interior design takes its cue from the Wiener Werkstätte (an offshoot of the Vienna Secession art movement), which promoted the idea of Gesamtkunstwerk, or, total work of art – elevating everyday objects to art forms. Bedrooms feature wallpaper designed by Koloman Moser, a co-founder of the Wiener Werkstätte who is widely credited as being the world’s first graphic designer. Their oval windows are fitted with a divan bed inspired by Biedermeier furniture so you can lie back and watch the old city centre go by below you. Hotel Topazz’s modern credentials carry through to the 21st century: it’s also the area’s first green upscale hotel. Visit Viennese Modernism 2018 for more information. Getting there: Thai Airways flies to Vienna from Australia via Bangkok.